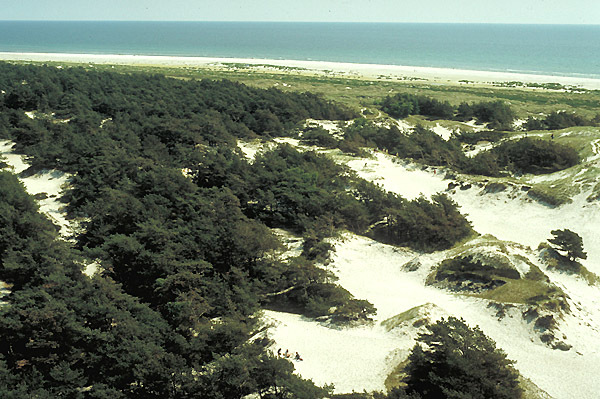 At Dueodde, the southern tip of the island Bornholm, lies big areas of sand dunes with plantations of coniferous trees. The sand is known for beeing especially white and fine. The landscape is varied with large sand dunes and wet depressions. Near the Baltic Sea the beach is broad and it is one of the best places for bathing in Denmark and much visited during the summer. The plantations in land are old and some species from the scandinavian boreal forests can be found. The watchtower at Dueoddde is one of the highest - 45 m - in Northern Europe. The picture is from the watchtower.